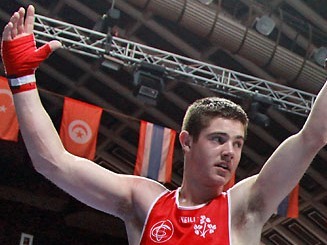 The death has taken place of Irish Olympian Bertie Messitt after a long battle with a neurologial disease. Born in 1930 in Bray, Co Wicklow, Messitt ran for Ireland in the marathon at the Rome Olympic Games of 1960. He also competed in the European Championships of 1958 and 1962 and held 16 national athletics records, in distances ranging from 3,000 metres to the marathon, in a long and distinguished career. Messitt contributed hugely to the sport he loved. 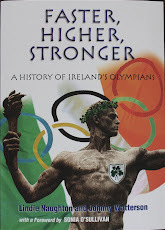 He was one of the founding members of the Donnybrook Athletic Club based in Donnybrook bus depot, where he worked, and of the Business Houses Athletics Association. From that came the Dublin Marathon. The life of Messitt, a true gentleman of sport, is chronicled in a biography called 'From Boghall to Bethlehem and Beyond'. * Nice tribute to Bertie by Niall Mathews of RTE at www.bhaa.ie. Table tennis players Eimear Breathnach, Rena McCarron Rooney and Philip Quinlan have booked their London 2012 Paralympic places after a tough 2011 picking up ranling points at tournaments over Europe. This will be Breathnach’s second Paralympic Games; McCarron Rooney and Quinlan will make their Games debuts. For the very first time, an Irish equestrian team of four riders has qualified for London 2012. The team’s score of 419 pts from the Hartpury International event last summer put Ireland 8th on the world rankings, with 12 places available. To date, 22 Irish athletes have qualified for the London 2012 Paralympic Games, starting on August 29. * Catherine Walsh and Francine Meehan, who had won their specialist 3km tandem pursuit earlier in the week, finished third in the women's match sprint at the Paracycling Track World Championships Los Angeles, USA. Colin Lynch won the C2 3km pursuit, while James Brown and Damien Shaw were second in the 4km tandem pursuit. That means the Irish came home with four medals - two golds, a silver and a bronze and a best ever world ranking of 7th from 31 countries. Ireland's ranking points total for the London 2012 Paralympic Games will be known in two weeks time. This will decide the number of paracyclists that can be selected for the team. Over the last 5-6 years Ireland have been at the forefront of international tandem racing, with Catherine Walsh the permanent fixture thus far in the women’s tandem. Walsh has a strong sporting accolade, and this year is hoping to add a Paralympic title to the bronze medal she won in the pentathlon at the Games in Sydney in 2000. In 2010 Walsh started partnering with Meehan, a dominant force in Irish women’s cycling in recent years. In the tandem event, a visually impaired athlete (the stoker) partners a fully sighted rider (the pilot). Tandem racing is fast and furious, given the double power output, and is an exciting spectator sport. The pursuit is a 3km race against the clock with the qualifying test being all important since only the top four riders get to race for medals – the top two race for the gold medal. 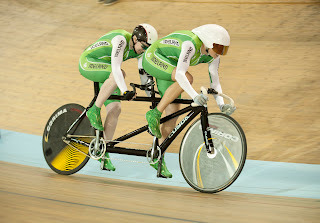 The Irish women’s tandem achieved a top time of 3.37, putting them straight into the gold/silver ride off. In the ride-off, the bikes start at opposite ends of the track and try to catch each other – the Irish bike won the race with three seconds to spare, securing the coveted rainbow jersey. 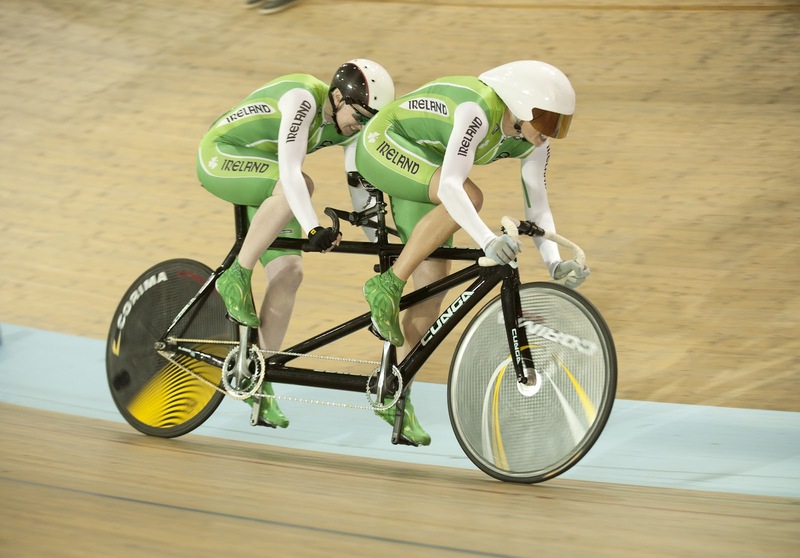 Ireland’s second female tandem of Katie George and Sandra Fitzgerald came a credible 7th place in their first major competition as a pair. This all bodes well for the ultimate event – the Paralympic Games this summer in London. All going well, the fruits of the last few years will pay off for the Paracycling squad, under the tutelage of Denis Toomey, Brian Nugent and Gerry Beggs. In the squad this was not the only success story. Colin Lynch also won the pursuit adding to the time trail rainbow jersey he won at the Road World Championships. The men’s tandem pairing of James Brown and Damian Shaw achieved their best result to date with a silver medal in the pursuit; the second tandem of Andy Fitzgerald and Con Collis came 6th, with a time that would have been an Irish record before this stormer of a weekend. Enda Smyth and Cathal Miller were both in action in the C3 and C5 events respectively, their superb performances placing them both in 5th plac. Mark Rohan double world champion in handcycling is ready to join the team when they get home. There is no track cycling event for handcyclers.